It is maybe appropriate that Ian is with the Glasgow University team in the picture above because he was always a very popular athlete with his peers and was a key member of a very good Glasgow University squad. I first met him when he was a Junior and one of a quartet which included Alastair Douglas and two athletes that I was coaching at the time: Douglas McDonald (on the left above, number 42) and Robert McWatt a Scottish Junior Internationalist who emigrated to Canada in the early 80’s. Although he had a successful career with Scottish Championships and British medals to show for it, he was the kind of athlete that always felt could have possibly done even more. Maybe Alastair Douglas in his comments below will be able to throw some light on that point. Personal bests of 1:50.42/3:42.39/4:02.4/8:02.9 and 14:34 are not too bad at all so we now know that he could run fast. 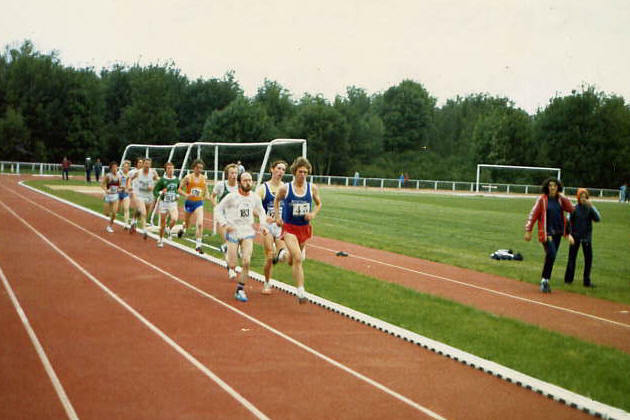 In terms of his competitive record, Ian won the Scottish 1500m championship twice – in 1980 and 1983 – and was second in the AAA’s indoor 1500m in 1983 and third in the British 1500m in the same year. 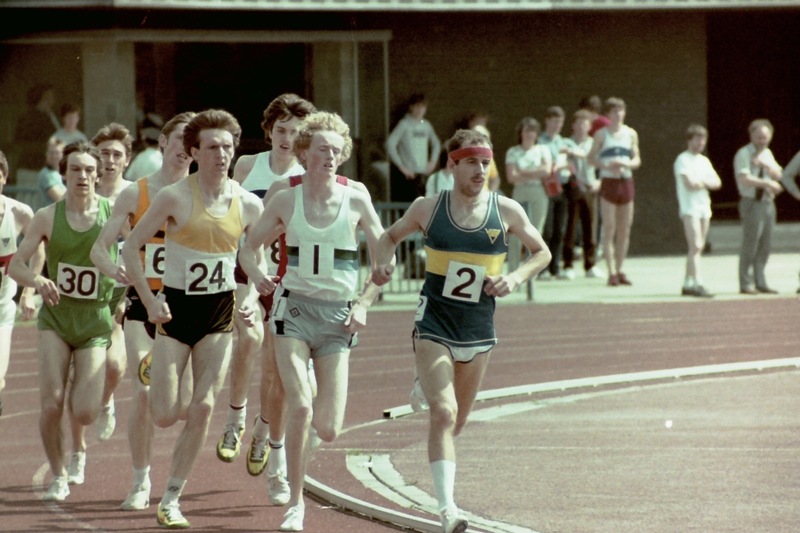 In the course of his career he ran for East Kilbride AAC, Glasgow University AC, Durham University AC and Worcester AC but the next section of this profile is written by his old friend Alastair Douglas. Ian, second right, behind Alastair Douglas, in Paris in 1980 on a University trip. “Ian and his two brothers Derek and Robin were all talented runners as was their father before them. 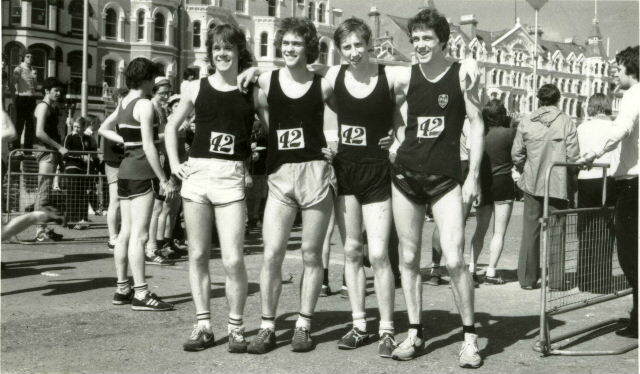 Ian was slightly different in that he was a middle distance runner rather than a sprinter like the others. He started running at about age eleven and tended to train only a couple of times a week but did very well on that. He had a rather ungainly running style with a wobbly head which made you feel more annoyed when he beat you. Added to that he was not short of self confidence and spoke his mind. However if he did beat you, rather than saying how well he was running, he would slag you off for not being able to beat him. I remember running against him in the West District Junior 1500m championship. I did in fact beat him in this race. It was the first time I had ever got under 4 minutes and was quite pleased with myself. However I felt quite deflated when speaking to Ian afterwards. He had only finished three seconds behind me and was saying he couldn’t understand how I was not further ahead of him when I trained seven times a week and he only twice a week. The thing is, you knew he had a point! Although 1500m was his best event, he was a threat to anybody over anything from 800m to 10K. After leaving Glasgow University, he did a PhD at Durham University. He joined Alan Storey’s training group which included Olympic medallist Mike McLeod. I don’t think Alan felt that Ian took his athletics too seriously. There was once when Alan warned John Solly – the 1986 Commonwealth 10000m champion – not to race Ian over 1500m as it might undermine his confidence as he prepared for the Commonwealths. However he did race him, and Ian beat him. However as Solly went on to win the 10000m at Edinburgh perhaps Alan Storey’s fears were unfounded. One of Ian’s best races he feels was over a distance much longer than he would normally race. This was over 7 miles and was again against John Solly. Ian again beat him. However it was not simply a case of hanging on and winning in a sprint: he basically took more than a fair share of the pace and dropped him wit a few hundred metres to go. ,Alastair speaks of the victory in the 1500m in 1980, well the moment when, after tucking in behind on the bend he moved out to go in front were captured by Alastair Shaw. The pictures below can be enlarged by clicking on them – thanks Alastair! Alastair ends his review of Ian’s career there and it gives an interesting insight into the athlete. What is missing however is any reference to regular cross country or road running and from the list of ranked performances above, it would seem that he was a pure middle distance runner over 800m to 5000m, anything longer being the exception rather than the rule. The big Scottish winter race was the Edinburgh to Glasgow eight man relay. Surprisingly he only seems to have turned out in two races – in 1978 he ran the seventh stage and in 1980 he ran the very difficult second stage but in each of them he held his position in the field and in neither was he inside the top ten times. When I asked Alastair about Ian’s cross-country running he said, “he was much better on the roads than on the country and in the year that I won the Junior National in 1981, I raced him in the Scot Unis on a flat, fast, dry course. I won and he was second but it was very close. 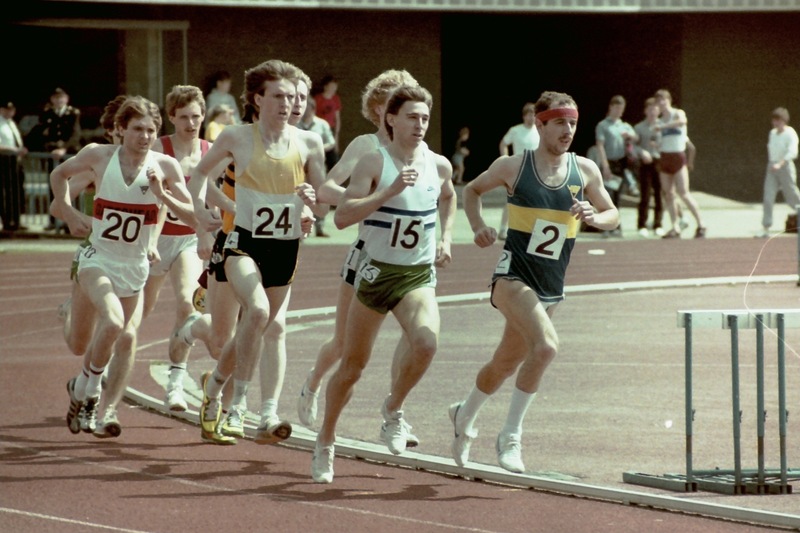 On that form he would certainly have medalled in the Junior.” In the race below, the National of 1987 at Falkirk, he finished fourteenth in a quite outstanding field – Nat Muir, Chris Robison, Tommy Murray, Neil Tennant, John Robson and many more top athletes. This was his best result in a race that he tended to avoid although on this showing, and on Alastair’s testimony, he could have done well. 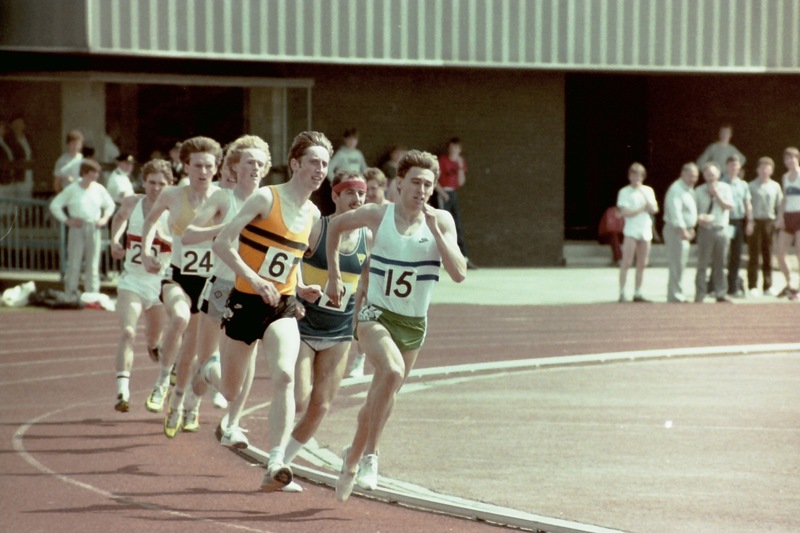 Ian (384) in the East Kilbride colours in the National of 1987: the lap-by-lap story! I suspect that Ian would not want to dwell on cross-country since he reckons that “cross-country should be for convicts for whom the birch is too good!” Another of his thoughts, by the way, is that anyone over the age of 25 should be banned from athletics: “grown-ups shouldn’t like beating people.” Back on the Track we could take a closer look at the two seasons when he won the SAAA 1500m title: 1980 and 1983. The 1980 championship win in June 1980 (3:48.4) was he says his most memorable win – he was just 19 and he was enjoying training with Alby Smith of Victoria Park. Two weeks later he picked up the British Universities 1500m in 3:50.9. Two good races but his pb for 800m was yet to come. The Edinburgh Highland Games had been a wonderful mix of international athletes and local Scottish handicap events held at Murrayfield where locals could run shoulders with Olympians. After the Commonwealth Games in 1970 however, it became an International Event only and incorporated internationals or inter-city contests. In 1980, sponsored by The Glenlivet, the match was between Warsaw, London and Edinburgh. Ian was Edinburgh’s representative in the 800m and the opposition was good: Gary Cook (London), Owen Hamilton (Jamaica), Stanislaw Rzeniaczak (Warsaw) and Mark Enyeart (USA). Ian responded to the challenge and set what was to be his all-time pb of 1:50.42 for the distance. All-in-all a good season – but nothing like as good as 1983 was to prove to be. He started the year with two British international vests. On 19th February running indoors for Great Britain against West Germany indoors at Dortmund, he was third in the 1500m in 3:44.67 – a very good indoor time, and four days later in the GB v Russia indoor match at Cosford where he was second in a pb for the 3000m distance of 8:03.92 which must have been an even better run. The outdoor season that year started on 2nd May with a win in the English Universities 1500m in 3:52.4. At the end of the month he was third in the UK Championships 1500 in 3:45:95. These set him up nicely for the SAAA Championships on 18th June where he won the 1500m in 3:42.39 which was another pb. The Scotland Six Nations International is a nice meeting – at one time called ‘The Small Nations’ international – which used to be between Scotland, Wales, two Irelands, Turkey and Israel. Israel has now dropped out but at that time all six were competing and they were hard fought competitions – it wasn’t often that any of them had the chance to win any international match, Ian, in his third representative match of the year and his only one for Scotland, was disqualified for pushing. It happens in 800m races all the time and the runners expect it: to disqualify an 800m athlete for it seems a bit harsh! He went on racing on the Scottish scene and then in England when he was at Durham. He is on record as saying that his favourite races were handicap races where everyone could compete and challenge for first. Alastair referred to the British Professional Two Mile Championship. Ian says, “It was the British Professional 3200m championship held at Inverkeithing on 4th August 1990. I was first in 9:09.47 which was a new record (the old times were for Two Miles) and I think I still hold the 3200m record.” Indeed he does – the run was on a a 400m red ash track and was not the only victory he had on the professional circuit where he raced in 1990, 1991 and briefly in 1992. I have his other winning marks in the table below. That is a comprehensive record of his victories on the Games circuit and we know that as an amateur he had run at Strathallan and other Games Meetings. It is clear that he was equally adept on all surfaces – road, country, tartan, grass and red gravel tracks. Ian and his group of friends all seemed to be enjoying their athletics; some took the sport more obviously seriously than others but there is no reason why you can’t plan, train and do your best and have a good time doing it. Of all the profiles on the site, over 150 now, Ian is the one who comes across as enjoying the sport for its own sake maybe most of all. It’s a real pity he stopped as early as he did.